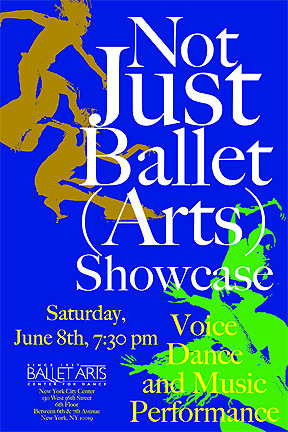 Join us for our ANNUAL EXPIRIMENTAL SPRING SHOWCASE, June 8th, 2019, 7:30pm at City Center Theatre, 130 W 56th St. - 6th FL. This spring's student-driven showcase, entitled "Not Just Ballet (Arts)", features the Choreography and Music of the diverse Ballet Arts student body. NO COVER! Come and enjoy!